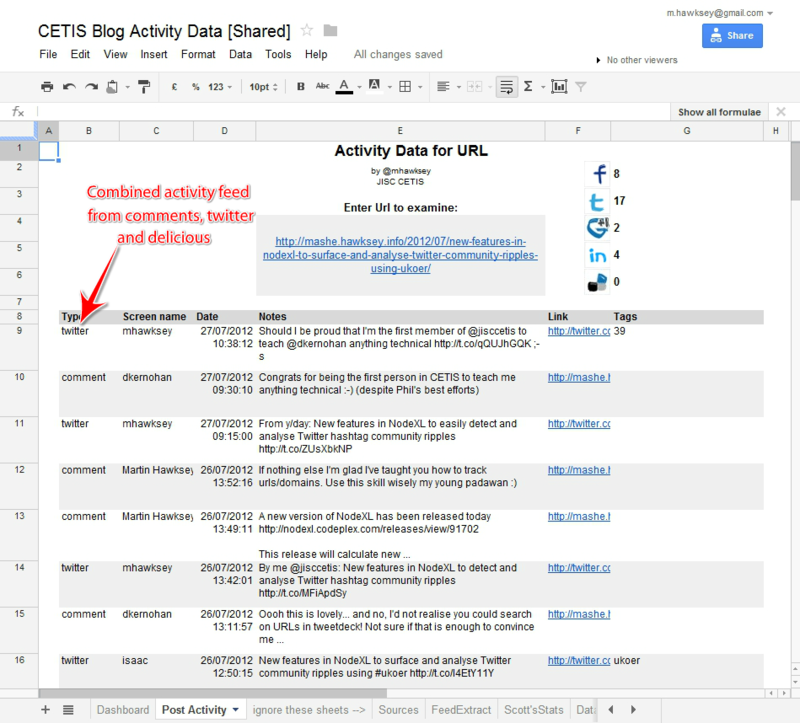 In my last post announcing a Google Spreadsheet Template for getting social activity around RSS feeds I mentioned it was built from spare parts. 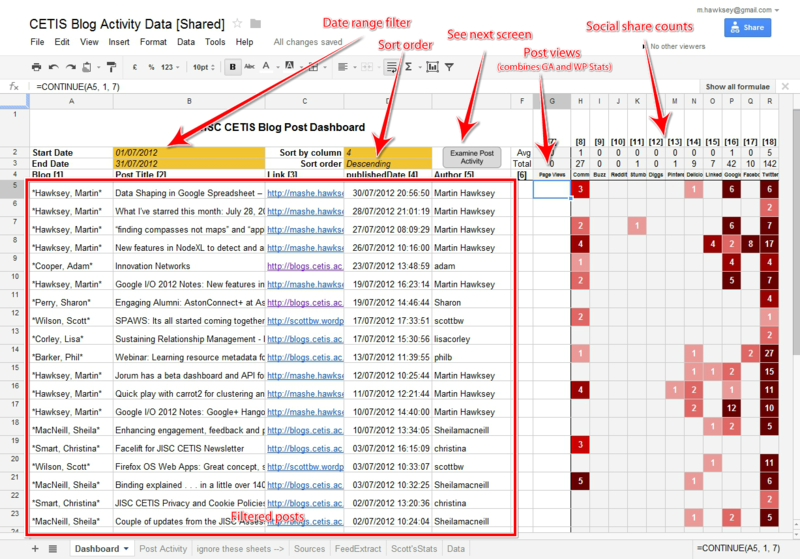 It came out of on-going work at CETIS exploring activity data around CETIS blogs (including this one) and JISC funded projects. In this post I’ll highlight some of the current solutions we are using and how they were developed. To put this work into context it aligns with my dabbling’s as a data scientist. It’s perhaps not surprising that the main tool I use for these explorations with data is Google Spreadsheets/Google Apps Script. The main affordances are a collaborative workspace which can store and manipulate tablature data using built-in and custom functionality. To illustrated this let me show how easy it is for me to go from A to B.
I’ve already posted how we are Using Google Spreadsheets to dashboard project/course blog feeds #oerri. For this we have a matrix of project blog feeds and a set predefined categories/tags. As projects make different posts a link to them appears on the dashboard. As part of the programme completion JISC are piloting a new project survey which will include reporting the ‘reach of the papers/articles/newsitems/blogposts out of the project’. 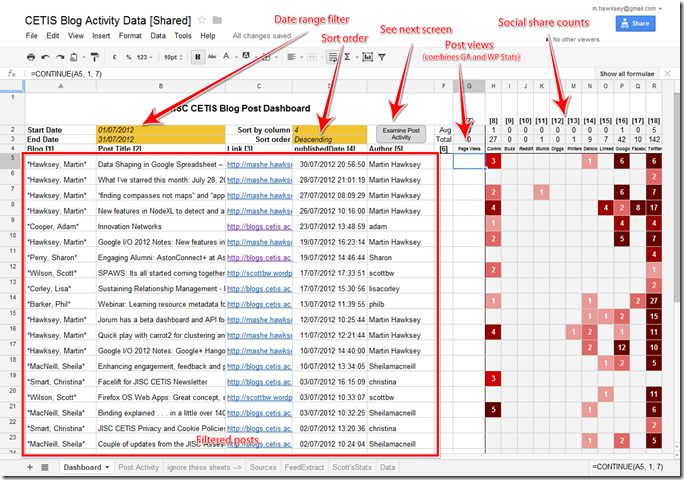 Out of curiosity I wanted to see what social share and other activity data could be automatically collected from project blogs. 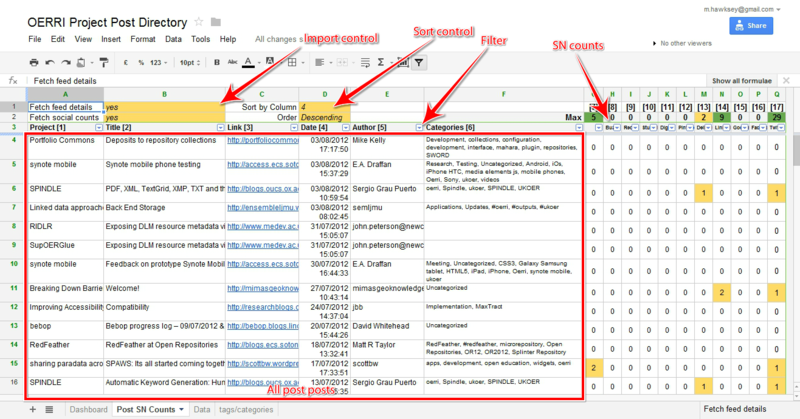 The result is the page shown below, which is also now part of the revised OERRI Project Post Directory Spreadsheet. The important bit is the columns on the right with social counts from 10 different social network services. So we can see a post by Xenith got 29 tweets, a post by bebop got 5 comments, etc. Getting a single sheet of blog posts for a list of RSS feeds. Getting social counts (Likes, Tweets, Saves) for a range of services. You can use built in formula like importFeed to do this, but you are limited to a maximum 20 post items and you need to do some juggling to get all the results from 15 projects in one page. An alternative, which I quickly ruled out was fetching the rss xml using Google Apps Script and parsing the feed. The issue with this one is RSS feeds are usually limited to the last 10 posts and I wanted them all. The solution was to use the Google Feed API (can’t remember if this is on Google cull list). The two big pluses from this are it can pull historic results (up to 100 items), and results can be returned in JSON which is easy to work with in App Script. When you use spreadsheet formula that write results to multiple cells sorting becomes a problem because the cells are generated using the CONTINUE formula which evaluates a result from the initiating cell. When you sort this reference is broken. The solution I use is to pull the data into a separate sheet (in this case Data) and then use the SORT formula in the ‘Post SN Count’ sheet to let the user choose different sort orders. The formula used in ‘Post SN Count’ to do this is in cell A4: =SORT(Data!A4:Q,D1,IF(D2=”Ascending”,TRUE,FALSE)). To try and prevent this being broken an ‘Item from list’ data validation is used with the ‘Allow invalid data’ unchecked. 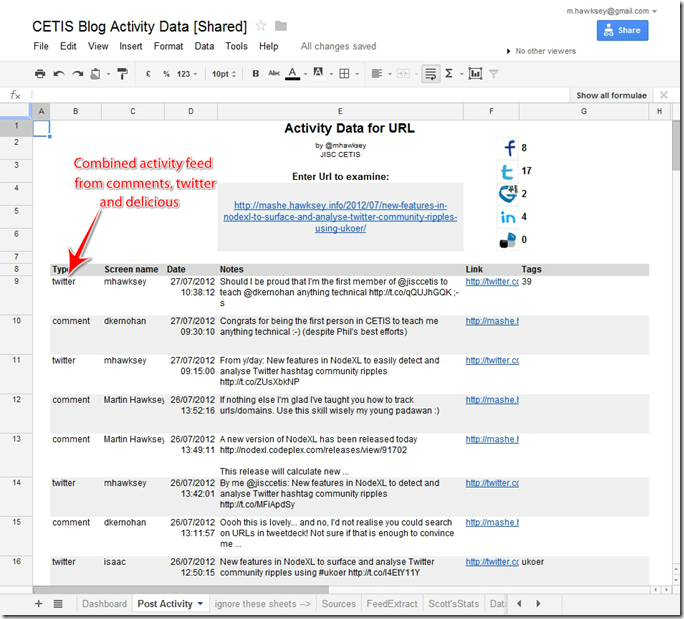 Having got social share stats for other peoples feeds it made sense for the JISC CETIS blogs. At the same time because I keep my blog on my own domain and Scott (Wilson) is on wordpress.com it was also an opportunity to streamline our monthly reporting and put all our page views in one place. Below is a screenshot of this de-page viewed version of the CETIS dashboard (the code is all there I’ve just haven’t authenticated it with our various Google Analytic accounts). With this version the user can enter a date range and get a filtered view of the posts published in that period. Sort and social counts make a re-appearance with the addition of an ‘Examine Post Activity’ button. With a row highlighted, clicking this gives individual post activity (shown in the second screenshot). The code for this part got recycled into my last post Google Spreadsheet Template for getting social activity around RSS feeds. To get to this end point there are some steps to pull the data together. First the ‘Sources’ sheet pulls all our blog urls from the CETIS contacts page using the importHtml formula. Next on the ‘FeedExtract’ sheet the array of blog urls is turned into a sheet of posts using the same code in example 1. Social counts are then collect on the ‘Data’ sheet which is read by the Dashboard sheet. Having some existing code to get stats from Google Analytics made it easy to pass a url to one of two GA accounts and get stats back. Because Scott is on wordpress.com another way was required. Fortunately Tony Hirst has already demonstrated a method to pull data from the WordPress Stats API into Google Spreadsheets. Following this method stats are imported to a ‘Scott’sStats’ sheet and tallied up with a code loop (WordPress stats come in on per post, per day). 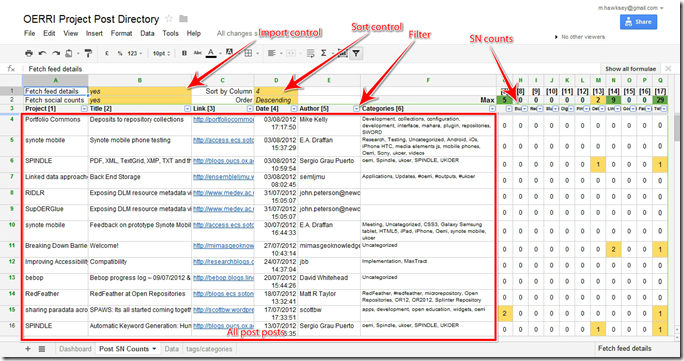 Note: I use a custom Google Analytics function available in the spreadsheet script editor. There’s a new Analytics Service in Apps Script as an alternative method to connect to Google Analytics.